Lost Knife Hideout is a large, leveled cave system that serves as the hideout for the Lost Knife bandits. It consists of two internal zones: Lost Knife Cave and Lost Knife Hideout. Dungeon Delving (Bandits): Do a favor by retrieving an item from a bandit hideout. Dungeon Delving (Caves): Do a favor by retrieving an item from a cave. Lost Knife Hideout is fairly easy to miss from a distance, but can be spotted by looking for the small waterfall-fed pond with two clusters of harvestable slaughterfish eggs, although there are no slaughterfish to be found in the pond. The pond contains a large selection of small fish used as ingredients in alchemy and the typical blue and orange dartwings feeding above the water. There is a patch of imp stool fungus to the left of the entrance, which is marked by impaled corpses either side of the entrance into the cave. The cave has a notable stream that runs throughout, which is fed by the pond outside. As you follow it downstream, you can hear two Bandits talking about wrestling a sabre cat that they have caged. They also mention that someone killed a cave bear with their bare hands. If you wait, one will leave and go on patrol; alternatively, you can just attack immediately. The archer carries the Lost Knife cage key, which open the cages they were referring to. They are standing by a campfire with stacked barrels on either side; some of these hold ingredients and others foodstuffs. Against the cave wall is a table holding a random sword, two bottles of wine and some bread and cheese. To the right is a barrel with a potion of minor healing and a potion of health on top. To the right are a pair of archery targets and to the left is a tanning rack. Before crossing the bridge to follow the stream, an iron ore vein is just past the watch post. Follow the stream to a large cavern with an underground lake surrounding an island with two earthen bridges, one crossing from this side to the island and the other crossing from the island to the southwest. In the middle of the island is a rock pillar rising to support the roof high above. As you emerge into the large cavern, take care to avoid the bone chimes hanging beneath some wooden scaffolding, with a woodcutter's axe lying on the ground beneath them. On the island are two bandits roaming over more scaffolding that surrounds this side of the pillar. High above you to the north is a wooden walkway hanging off the side of the cavern wall. The walkway descends ending on top of the scaffolding with the bone chimes under it. This is your exit route after traversing the whole of the cave system. There are two bandit archers patrolling this walkway and they will gladly join the fray if alerted to your presence. They'll either snipe you from above, or descend and tackle you face-to-face. You can wait until later to dispose of them if they are too difficult to kill with ranged attacks. There is another bandit patrolling the bridge to the southwest, with another standing on a ledge high above the far end of the bridge and concealed behind a waterfall. On the upper level of the scaffolding is a table with a copy of the Two-handed skill book Words and Philosophy, a random bow and a single random arrow on top. The bandits apparently have set up a diving board from the lower platform. To reach this you pass to the right of the scaffolding before passing under the upper level. A short swim underwater to the south, beneath a waterfall leads to a small grotto containing an unlocked chest, a random cuirass, two food barrels, a piece of firewood and an iron ore vein. There are plenty of salmon to catch in the lake as well. A bandit may sometimes fall from the top walkway and pursue you while swimming, or if dead you're able to loot them in the water below. The ramp leading back out of the water starts beneath the diving board and circles around reaching the top immediately to the right of the southwestern bridge. The natural earthen bridge crosses to a wide passage, which continues to the southwest, passing a couple more bone chimes and a tripwire that triggers a falling rocks trap from above. It can be easily avoided even by followers. The path switches back and rises, passing the chute for the boulders on the left. At the top is an intersection. Ahead the passage leads to the balcony seen previously overlooking the earthern bridge in the main chamber, while to the left and left again the path descends to a wooden walkway overlooking the switchback. A bandit will either be standing above the switchback or patrolling to/from a small room behind. There is a second bandit sitting at a table, on a raised wooden platform at the back of the room. There are numerous barrels stacked around the room, mostly of food. Under the table the bandit is sitting at is an unlocked chest. On the same table is a gourd and a single loose septim. The only other item of note in the room is an iron ore vein. Heading towards the balcony overlooking the main chamber, you will pass a passage on your right. There is a stack of barrels by the edge of the balcony, with a random bow on top. One of the barrels holds ingredients. The passage on the right leads to Lost Knife Hideout. Returning from Lost Knife Hideout through the shortcut brings you along a passage formed by the stream. Just before it falls down the cavernside there is a turning on the left. The walkway heads left and right in front of you. Any bandits not dealt with from below will still have to be faced. Heading to the right leads to a ledge where a campfire burns; nearby are two unowned bedrolls, an unlocked chest, two random potions of healing, and a random enchanted sword. Following the walkway to the left leads down to a short drop and the exit. The hideout has been built into the buried ruins of an old fort. If you are detected entering the hideout, three bandits will attack you and a fourth may shoot at you from a walkway above. If sneaking, you can surprise the three bandits who are gathered in a room to the right. You pass through a hole in a wall to reach the room, which is laid out as a bar with a counter in the southern corner and tables to the northwest. In the northern corner is a long wooden table with an iron battleaxe and a piece of firewood on top. To the right is a barrel and a set of shelves holding two gourds, four garlic bulbs and another piece of firewood. Opposite the table is a cupboard with two portions of grilled leeks, several cheese wheels and two food sacks on the shelves. Hanging from the ceiling in this area are three racks holding three garlic braids, two rabbits and two pheasants. There is a bottle of wine on the table two of the bandits were sitting at. Behind the counter is a rack holding three more rabbits and three more pheasants. There is also a set of shelves holding an iron mace, five bottles of wine and four of Nord mead, with a woodcutter's axe, a bottle of wine and four more bottles of Nord mead on the counter. On the table opposite the counter is a bottle of wine and two salmon steaks. To the right of the counter is a doorway through into a passageway with a T-junction ahead with stairs leading up to the left and down to the right and a cave-in. Among the rubble is an unlocked chest. At the junction, against the southwest wall are two sets of shelves holding a woodcutter's axe among items of clutter. 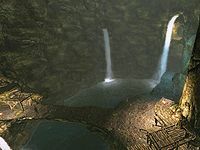 The stairs lead up to another junction, with another cave-in to the right and a small wooden table holding a copy of the Heavy Armor skill book Orsinium and the Orcs, a potion of health and two bottles of wine in front. Straight ahead is a dead end with four unowned bed rolls and an unowned single bed. A bandit can be found sleeping on one of the bed rolls. There are two bottles of wine on the floor, one by the bed and another by one of the bed rolls. At the foot of the bed is a food barrel with a knapsack beside it. In the southern corner is a small table holding a potion of minor healing, a bottle of wine and a sprig of snowberries. To the left the passage continues through a doorway into a room, which has had the wall opposite knocked out. There are several tables and chairs overturned and on the remaining upright table is a flute and two bottles of skooma. Beside this is an archery target with several iron arrows on the floor around it. Through the hole, wooden scaffolding has been built to form a bridge linking it to a passage opposite. As you cross, below you on the right is a corundum ore vein. Dropping down to mine it, you will discover an unlocked chest and two random potions of healing under the scaffolding. Follow the path down and back through the bar and around. Crossing the scaffolding to the passage opposite, you will pass a waterfall on your left, which falls through a hole, before the passage opens up into a large chamber containing five cages, a fighting arena formed from wooden planking and one of the cages acting as the gate into it. There are five bandits found around the arena and the bandit leader who is locked in the arena and can be heard taunting the other bandits to come and fight him. Once all the other bandits are dealt with, depending on your level facing the bandit leader may be a very difficult chore. The easy strategy is to keep him locked in the pit and practice your archery or destruction magic on him. Summoning a creature into the pit is also a source of amusement. In the cages is the sabre cat you heard talk of earlier and a dead wolf. All of the cages can be opened using the key carried by the archer near the entrance to the cave. 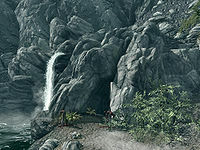 On your left, immediately after the waterfall is an area containing an unlocked chest, a set of shelves holding eight common books and an iron dagger. Beside this is a long wooden table holding a leveled potion of healing, a leveled potion of stamina and a random sword. To the right is a food barrel and a second set of shelves holding eleven more common books, a bottle of alto wine, a bottle of wine and three food sacks. There is a ledge overlooking the arena to the northeast with several chairs along it. To the southeast is an earthen ramp leading down to the caves and living area. Along the rear wall is a stack of crates with a grindstone beside them and a campfire with a cooking spit hanging over it. To the right of the fire is a boss level chest and a long wooden table holding a baked potato, another copy of the Lost Knife cage key and a piece of cheese. Beyond this is a set of shelves holding a random potion of health, a random potion of healing, a cheese wheel and loaf of bread. By the cage that's acting as a gate is a table holding an iron mace, an iron war axe, an iron sword, a random battleaxe and horker tusk. Between the cages heading northwest is a path that passes a string of bone chimes before heading up the stream caused by the waterfall to a master-locked chest and a corundum ore vein. You can drop down to this from the waterfall. To the right of the gate is a ramp and stairs leading up to a table and chair on top of the cage used by the bandits to view the action within the arena, and beyond this are more tables and chairs used for viewing. In the arena are several dead bandits, a dead cave bear, and in the southern corner a gold ore vein. The stream also passes through the arena before exiting in the eastern corner, under an unlocked gate. Following the path downstream leads to a shortcut back to Lost Knife Cave and the walkway high on the cavern wall. An iron ore vein is outside the cave to the east of the lake by the entrance. A corundum ore vein is outside the cave, west-northwest of the entrance. Lost Knife Hideout also appears in ESO as Lost Knife Cave. The expert-locked cages are a good opportunity to increase lock-picking skill. If you picked up the cage key earlier, make sure to drop it before attempting to open a cage. This page was last modified on 14 April 2019, at 11:33.